The MPLAB® Mindi™ Analog Simulator is a comprehensive tool for analog circuit design and analysis. It contains two simulation engines: SIMetrix (SPICE) and SIMulation of Piecewise Linear Systems (SIMPLIS). This chapter is meant to be a quick start guide for using the MPLAB Mindi analog simulator to complete the exercises in the following chapters. It is not intended to replace the documentation and tutorials provided for the SIMetrix and SIMPLIS tools, which can be accessed from the 'Help' menu within MPLAB Mindi. To start the MPLAB Mindi analog simulator, double-click on the desktop shortcut after installation or select Start > All Programs > Mindi 8.00. 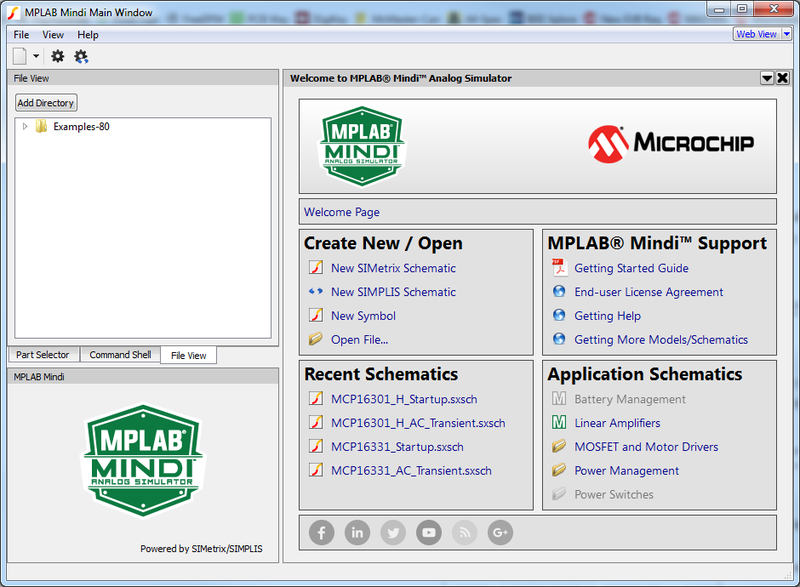 A splash screen will display the MPLAB Mindi analog simulator logo and brief licensing terms. After clicking OK on the splash screen, the MPLAB Mindi analog simulator graphical user interface (GUI) will appear and display the Welcome Page. 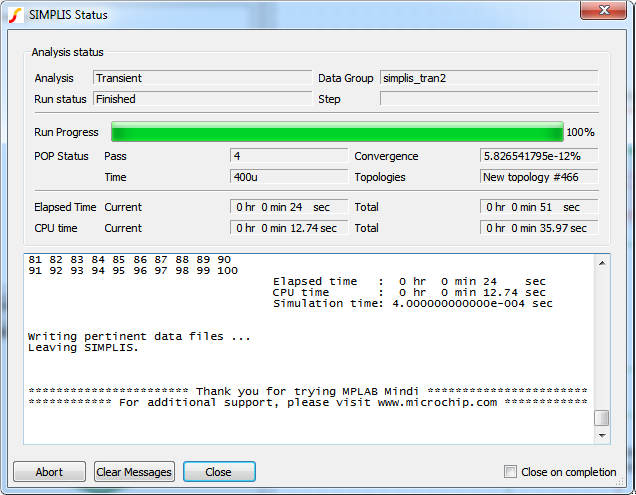 We strongly recommended that you let the MPLAB Mindi analog simulator periodically check for updates to ensure that the simulator always has the latest patches, models, and example application schematics. 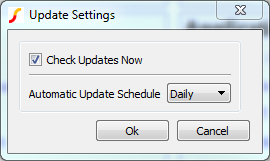 The update schedule can be changed by clicking on Help > Check Updates Now… and setting the 'Automatic Update Schedule' to 'Daily', 'Weekly', or 'Monthly'. Create New / Open: Open or create a new schematic or symbol for SIMPLIS or SIMetrix from scratch. 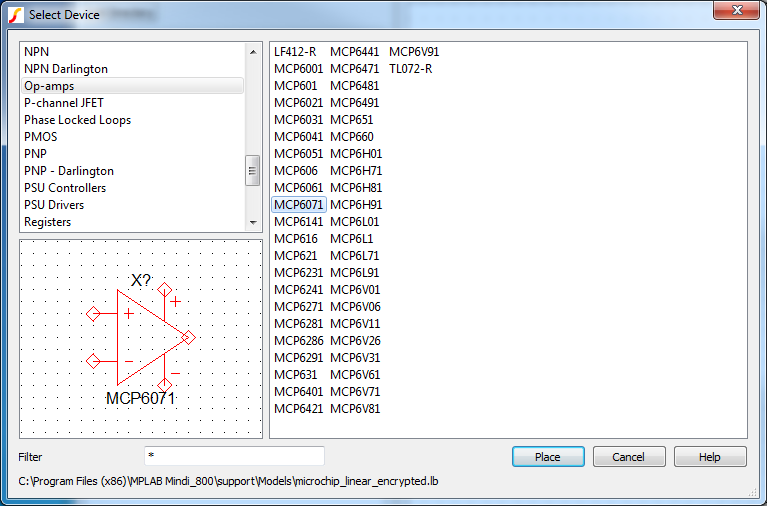 MPLAB Mindi Support: Get help or more application schematics from Microchip Technology Inc. Recent Schematics: Open recent schematics. Application Schematics: Browse application schematics by category. The Application Schematics panel can be used to browse the available example schematics by navigating through the product categories. The folder icon indicates another level of category hierarchy, whereas the MPLAB Mindi icon leads to a list of application schematics organized by part number. Faded icons represent categories that will contain application schematics in a future release. During navigation, the hyperlinked breadcrumbs will show the entire navigation path back to the Welcome Page. This allows navigation back to any level of the hierarchy with a single click. Application schematics are also preceded by icons that indicate which simulator engine is used for the particular schematic. SIMetrix files are marked by the icon, whereas SIMPLIS files are indicated by the icon. The application schematics can also be accessed via a folder tree by clicking on the 'File View' tab and navigating to the Microchip folder under SIMetrix or SIMPLIS. 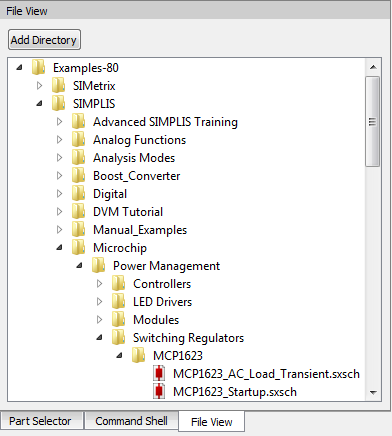 All application schematics are copied to your local documents folder when the simulator is run for the first time. When modifying one of these schematics, we highly recommended that you save a copy of the file (using File > Save Schematic As…) immediately upon opening the schematic to avoid overwriting the default version. You can create a new schematic from File > New > SIMetrix/SIMPLIS Schematic or by using the 'Create New/Open' quick links from the Welcome Page. Microchip models are available from the Place > From Microchip Library menu. The model list is organized according to product category, and only those models compatible with the currently selected simulator (SIMetrix or SIMPLIS) will be shown. Many common components can be placed via the toolbar at the top or the 'Place' menu. Of particular note is the Probe category under the 'Place' menu, which will allow waveforms to be displayed during simulation. All of the installed models can be viewed from the Place > From Model Library… menu, or by pressing the Ctrl +G key combination. This section discusses some of the terminology used in the following chapters to describe or analyze the characteristics of the circuit being simulated. The specifics of each term may vary slightly from device-to-device, but the following attempts to generalize key concepts across a broad range of parts. 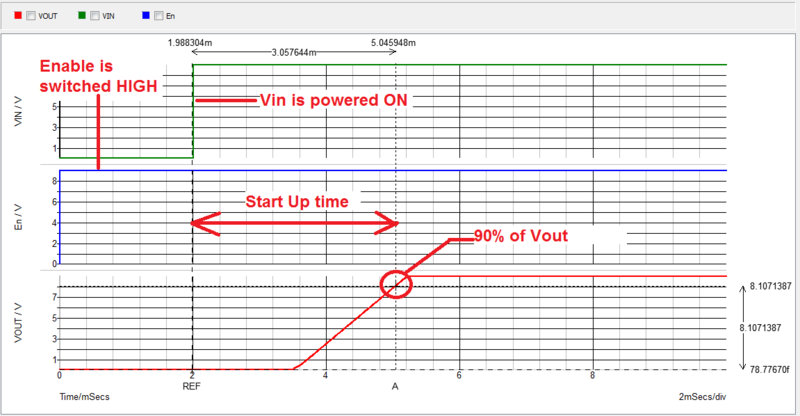 Start up from VIN refers to the behavior of the device or circuit when first powered. If the device has an enable pin, it is assumed that it is asserted simultaneously or prior to power up. 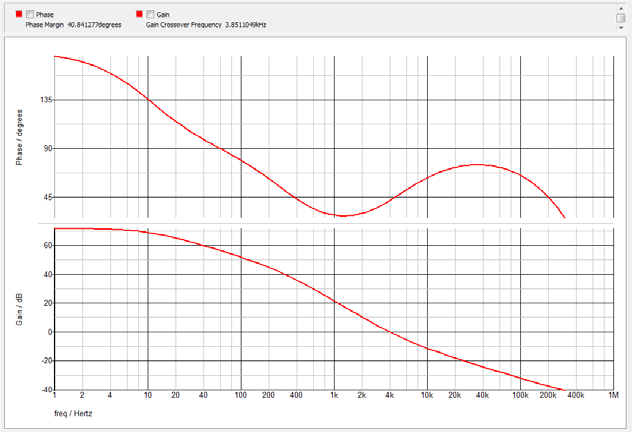 The start-up time is typically measured from the rise of the input voltage to 90% of the steady-state output value, as illustrated in the following waveform. Start up from ENABLE is the response of the circuit or device when an enable signal is asserted. It is assumed that the system has been properly biased and any settling times have been met prior to the enable signal being asserted. The start-up time, in this case, is typically measured from the edge (rising or falling, depending upon the required logic level) of the enable to 90% of the steady-state output value. Load transient response is a term used to describe the capability of a converter to maintain its output voltage during a change in the load. Typically, this is specified by the output voltage undershoot and overshoot during a load step, as seen below. PSRR is a term widely used to describe the capability of an electronic circuit to suppress any power supply variations to its output signal. It is often expressed in decibels. In power Supplies, Continuous Conduction Mode (CCM) is the operating region in which current flows through the inductor throughout the switching cycle. In Discontinuous Conduction Mode (DCM), the inductor current falls to zero for some portion of the switching cycle. The first half of the figure below depicts CCM. After the load current drops in the second half, the converter transitions to DCM operation. Devices that feature the Pulse Frequency Modulation (PFM) run in this mode for light load conditions and for large input-to-output voltage ratios. This results in a higher efficiency over all load ranges. However, the device will switch into Pulse Width Modulation (PWM) at higher load currents and lower input-to-output voltage ratios. PWM-only operation is recommended for noise-sensitive applications, exhibiting a much lower output voltage ripple. HyperLight Load (HLL) is a proprietary control loop; after the (constant) ON-time duration has expired, the control turns the high side switch OFF until the output drops below the threshold, which then triggers a new cycle. Using an NMOS low side switch instead of a diode allows for lower voltage drop across the switching device when it is on. In discontinuous mode, HyperLight Load is employed to regulate the output. This switching scheme improves the efficiency of the regulators during light load currents by only switching when it is needed. 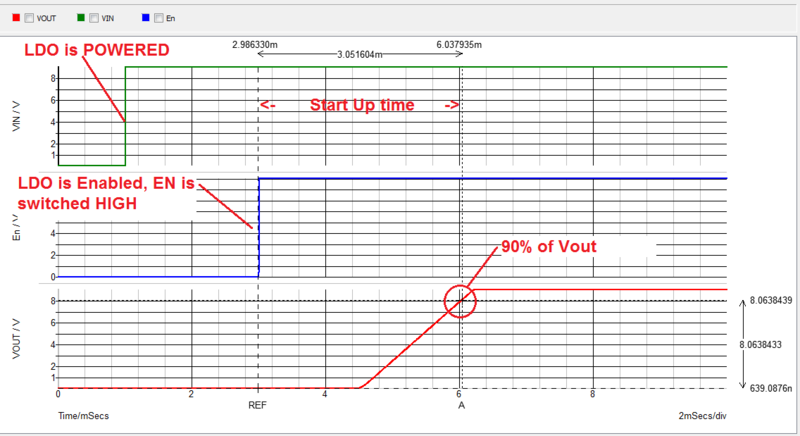 Soft start reduces the power supply input surge current at startup by controlling the output voltage rise time. The input surge appears while the output capacitor is being charged up. A slower output rise time will draw a lower input surge current. The Power Good (PG) output provides an indication of the output state of the device and is typically implemented as a comparator that trips when VOUT is below 90% of regulation voltage. The PG pin is commonly an open-drain output, which should be pulled up to the device power rail that is reading it. The PG delay time is measured from the point at which VOUT reaches 90% of the regulation value and the rising edge of the PG output. The PG response time is measured from the point at which VOUT drops below 90% of the regulation value to the falling edge of the PG output. 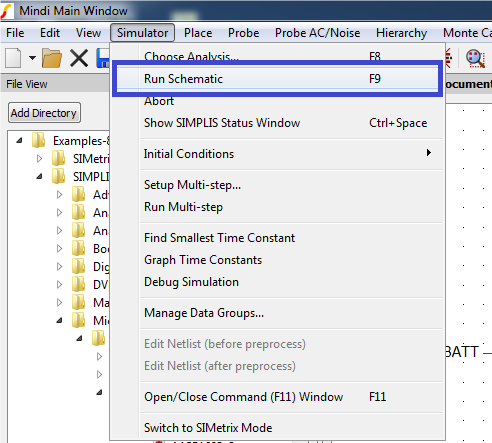 After opening a Microchip application schematic, you can run the default analysis by pressing the F9 key or by clicking on Simulator > Run Schematic. The default analysis type is highlighted in the application schematic’s file name (e.g., MCP1623_AC_Load_Transient), and its parameters can be altered after opening the Choose Analysis window, which is available by pressing the F8 key or by clicking on Simulator > Choose Analysis. If you want to run a user-created schematic, the analysis type and its parameters must be chosen first. 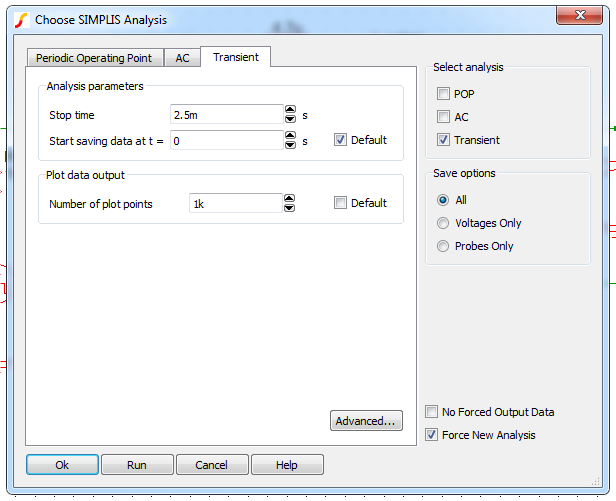 The analysis options for SIMPLIS and SIMetrix are different, and the models are generally not compatible from one tool to the other. 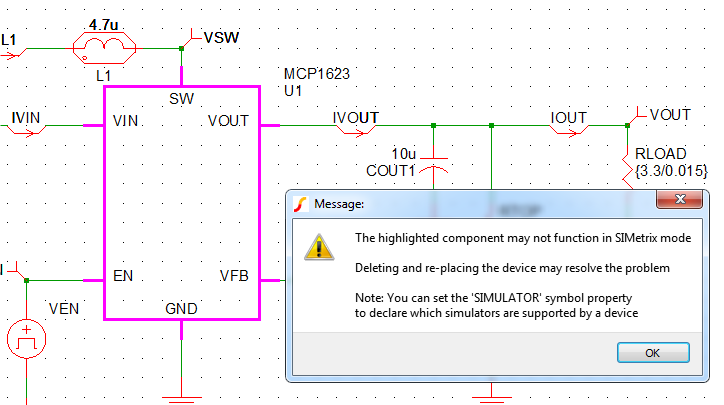 If you try to run a SIMPLIS schematic using the SIMetrix tool (or vice versa), the MPLAB Mindi analog simulator will issue a warning and highlight the incompatible components. You can monitor the status of the simulation and analysis in the simulation status window depicted below. 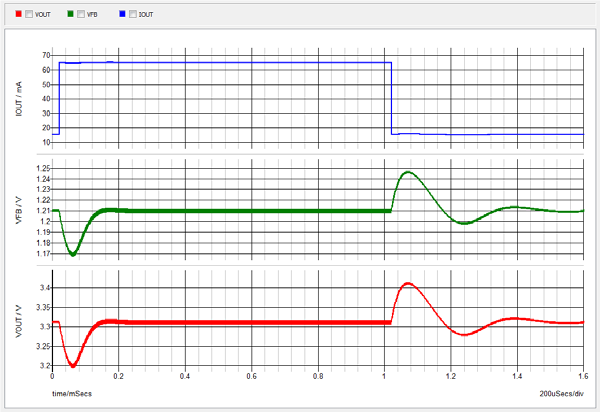 During simulation, incremental waveform results will be displayed, if enabled. Note that not all stimulus components or probes are functional with every simulation/analysis type. For each analysis type selected, ensure that the proper probes and sources have been added to the schematic. 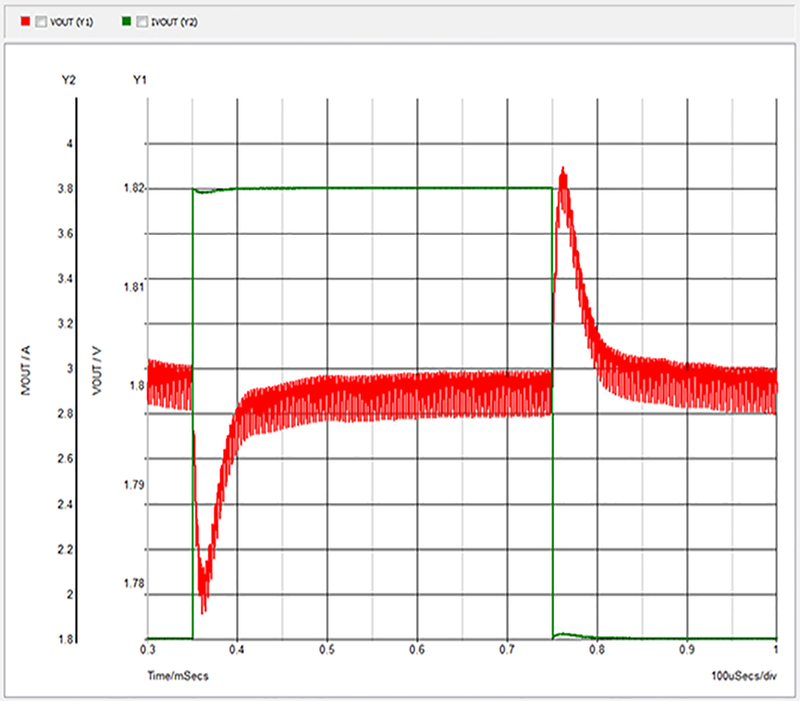 The MPLAB Mindi analog simulator can perform time domain (waveforms) and frequency domain (Bode plot) analysis. A time domain simulation shows characteristics, such as response time and overshoot. 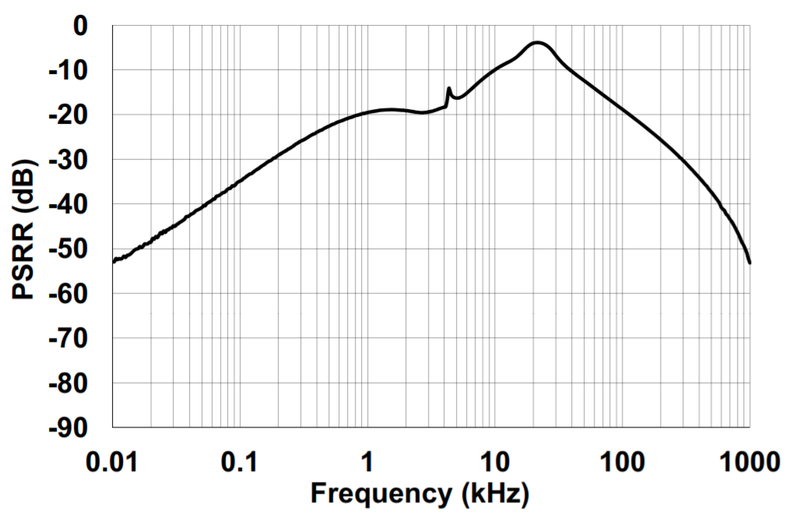 While time domain analysis shows how a signal changes over time, frequency domain analysis shows how the signal’s energy is distributed over a range of frequencies. This frequency domain analysis produces the Bode plots. These plots include critical information regarding the circuit’s closed-loop stability, such as gain and phase margins.